Funky First Grade Fun: Meet a Few of My Friends - Linky Party! for her Let's Get Aquainted Linky this week! I met Holly, from Crisscross Applesauce in First Grade, last summer at the Michigan Blogger Meet Up. I had been following her blog for a long time before that. We kept in touch after the meet up and discovered that we have lots in common. I smile when I find a message from her in my inbox. I laugh when I read the messages she sends. And...I think it would be great fun if we worked in the same school! And... Once upon a time, I received a nice email from a girl named Kristin. She said she was considering starting her own blog, but had some questions. I answered her questions and told her to let me know when she started her blog so I could check it out. Who knew that in just a few days she would turn out to be the famous Kristin from A Teeny Tiny Teacher? I recently posted about her too...you can read it here. We're both 4 feet 11 inches tall short. I like to be short. I never hit my head on anything. I love these gals and their blogs. I appreciate their sense of humor and admire their teaching ideas. More than anything, I value their friendship! Love ya, girls! Go visit and check them out! 2 more Mondays...I think I can. I think I can. I'm glad you picked holly! She is such a good friend! I too was at that meetup, and made an instant connection with her! I love her! Hope all is well! Thanks for stopping by. I would love to meet up again...it's just that my head is spinning at the moment. Maybe we can organize something for later in the summer. I hope to be able to meet up with some Ohio bloggers in the future. I am so excited to be able to give my blog some much-needed attention over the summer, too! 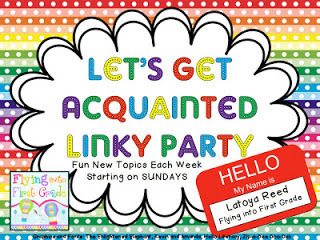 I found your blog through Latoya's Let's Get Acquainted Linky. I love your blog & I'm your newest follower. I've already seen some great ideas & I haven't dug that deep yet. Happy to be following you. I agree that your three blogging friends are absolutely wonderful! They share a wealth of teaching materials and resources! You are just as wonderful!!! Love all 3 of these blogging ladies. So glad you joined in on the linky becuase I found you too!